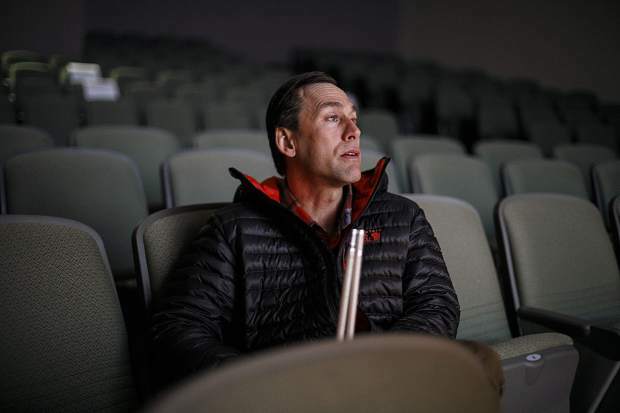 Blind adventurer Erik Weihenmayer sits in the auditorium before his speech at Colorado Mountain College in Breckenridge on Wednesday, March 21. 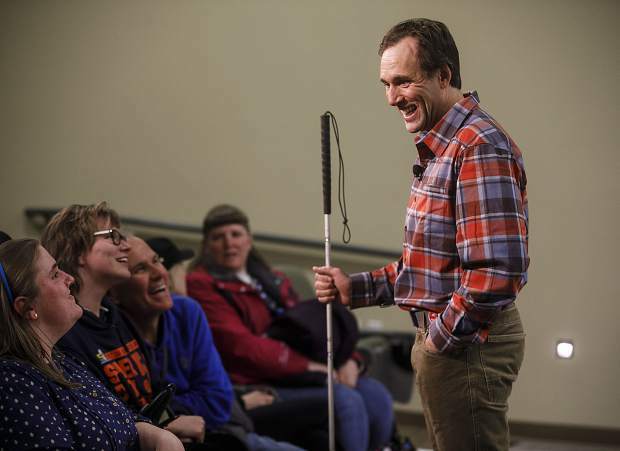 Blind adventurer Erik Weihenmayer smiles while speaking to the assembled crowd at his speech at Colorado Mountain College in Breckenridge on Wednesday, March 21. 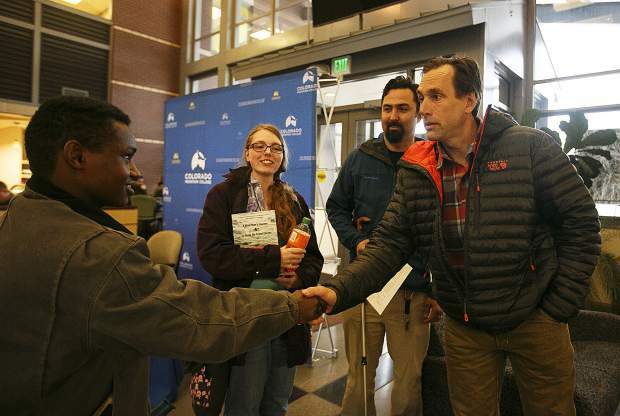 Blind adventurer Erik Weihenmayer greets Summit County locals before his speech at Colorado Mountain College in Breckenridge on Wednesday, March 21. 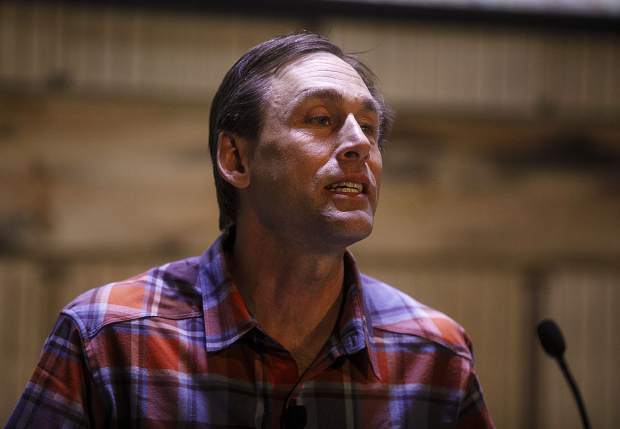 Blind adventurer Erik Weihenmayer speaks to the assembled crowd at his speech at Colorado Mountain College in Breckenridge on Wednesday, March 21. 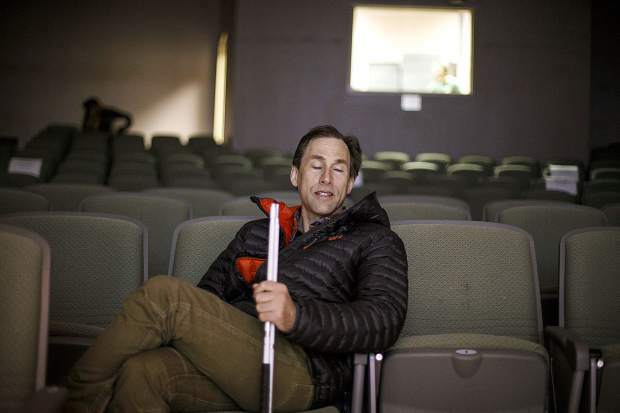 Yes, Erik Weihenmayer is the first totally blind person to summit Mount Everest. Yes, he solo kayaked 277 miles of the Colorado River through the Grand Canyon. And, yes, he may be one of the most talented inspirational speakers in the world. 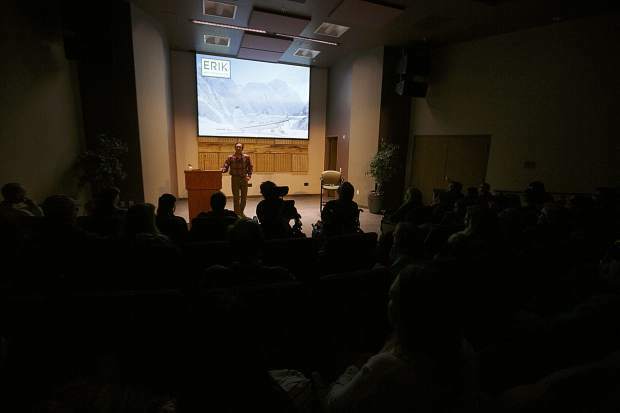 But on Wednesday evening at Colorado Mountain College, the Golden resident brought himself down to the level of each and every student, local resident and visitor packed into the CMC Breckenridge auditorium. Sure, he was there to sell and sign copies of his award-winning, best-selling book, “No Barriers: A Blind Man’s Journey to Kayak the Grand Canyon.” But Weihenmayer’s presentation was about much more than his successful white water journey through the Grand Canyon’s iconic rapids — namely the infamous Lava Falls. And, with that, the presentation was about much more than just himself. It was about connecting with every single person in the room. Case in point: More than a half-hour into his speech at CMC, he shared the story of another Colorado man to help the audience members understand how to “get started” and “move forward” with challenges in their own lives. By “bath towels and packing tape,” Weihenmayer was referring to that other Colorado man whose story he not only told, but helped to shape: Kyle Maynard. The quadruple amputee Maynard was born with a rare condition known as congenital amputation, where fibrous bands prevented the development of his fetal limbs. So in the middle of this presentation about himself and his own book, Weihenmayer shared how Maynard got started with his passion for mountain climbing. It’s a passion that would eventually lead Maynard to his summiting of iconic mountains such as Africa’s high point, Mount Kilimanjaro. The spark that lit Maynard’s mountain climbing journey occurred when Maynard asked to be a last-minute addition to a four-day “Summit” event put on by No Barriers USA. It’s the same organization for which Weihenmayer serves as board vice president. Weihenmayer was in attendance at that No Barriers Summit event above Winter Park. It was a hiking summit, one that included participants ranging from blind people learning how to use trekking poles to paraplegics learning how to crank themselves up a mountain by using their arms. “And then,” Weihenmayer continued to the assembled CMC crowd, “Kyle showed up. From there, Weihenmayer continued to explain how he, Maynard and the rest of the group went to his hotel room and stole a handful of bath towels. “Liberated them for a better life,” Weihenmayer said to a room full of laughs. He, Maynard and the rest of the group then continued to the hotel’s front desk, where they acquired foam, packing tape and shopping bags. The next morning, Weihenmayer and No Barriers pushed Maynard to the base of the mountain, helped him out of his chair and wrapped his arm and leg stumps up with the foam, bath towels, packing tape and shopping bags they’d collected the day before. For the next eight hours, Weihenmayer described a scene of Maynard “crabbing” his way through the trail’s dirt and mud, over its rocks and snow and to the top of a 12,000 foot peak. Less than a year later, Maynard became the first quadruple amputee to reach the summit of Kilimanjaro. All thanks to bath towels and packing tape. That was the message Weihenmayer was trying to get across to the college students in the room, whether he was talking about his own tribulations through Lava Falls, Maynard’s mountain climbing, or another No Barriers athlete’s accomplishment. The message that the greatest of triumphs and the best of progress are only possible when people use their creativity, ingenuity and passion to conquer seemingly-impossible tasks. “Over time,” Weihenmayer said, “terrible ideas like bath towels and packing tape, they give way to better ideas, right? “Through that iterative process that I bet you are studying,” he continued, bath towels became welding sleeves and pot holders and mountain bike tires that they cut up and glued over (Maynard’s) stumps. “And then,” he continued, “all the way up to these carbon fiber, prosthetic limbs with soles in the shape of elephant hooves and titanium crampons you can screw in for ice and snow. “Bath towels became Robo Kyle,” he concluded, “and it was by implementing that and by building this really strong team around him that Kyle, the next January, became the first quadruple amputee to reach the summit of Aconcagua, the tallest peak in South America — 23,000 feet.